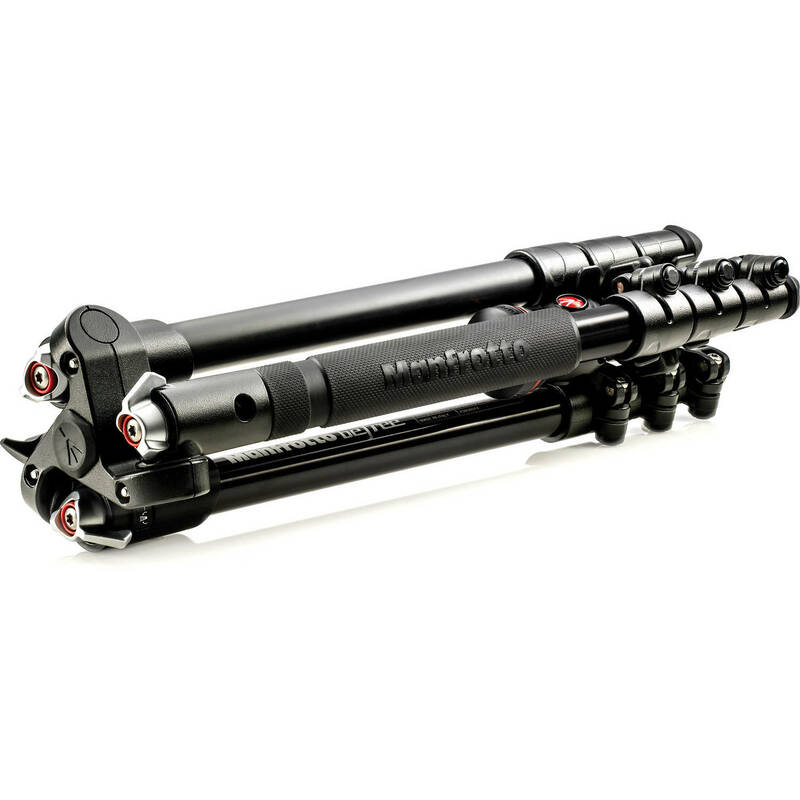 The Manfrotto Befree is a 3.0 lb tripod/ball head combo with four leg sections and a rapid column that rises to a combined height of 56.69”, folds down to 15.75” and can support still or video cameras weighing up to 8.8 lb. The Befree is an easy choice for hikers, boaters, bikers, air travelers or anyone else who seeks light weight and a small form factor. Discussion of lightweight tripods tends to vary reactions somewhere between incredulity and delight. Veteran photographers tend to raise an eyebrow and see no visible means of support, while others with more open minds welcome with open arms anything that minimizes the “lug-it-around” factor. The Befree is oriented toward the weight-sensitive group, while still having attributes that might appeal to the pro. Let’s not forget that this is a product from Manfrotto—a company whose long history of exacting design seems to invest the Befree with the Italian spirit of providing both style and performance in one package. The steadiest position for all tested cameras was with legs at 25 degrees, 1 leg extended, and no column extension. 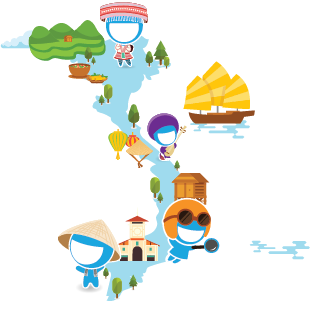 So let's start with the visuals. The Befree comes sheathed in a nylon, shoulder-strapped case with a stylish red stripe and white piping that fits the tripod like a pair of skinny jeans. 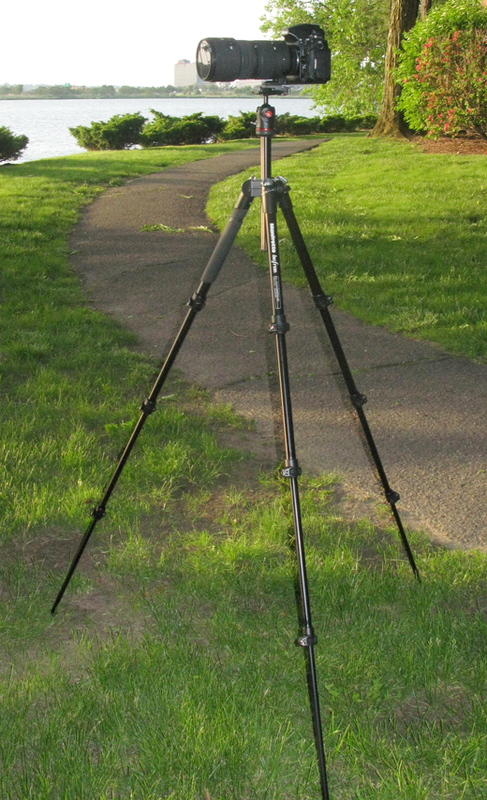 Along with Black, the BeFree aluminum tripod is also available in Red, Blue, Green, and Gray. The Befree has what’s come to be known as an “inverted-leg” folding design—think: origami meets engineering. It breaks down much the same as a standard tripod and then goes one further. Instead of folding it with the center column retracted, it’s left extended and the retracted legs folded upward toward its quick-release ball head. A little attention is required to align the ball head between the legs to ensure maximum flatness. Manfrotto has foreseen this by using a ratcheting knob on the head that is easily repositioned. The ball head itself is a mini type with a single wing knob controlling tension and panning. The quick-release platform comes with a 200PL-14 non-skid plate with a 1/4”-20 camera screw that is available separately for multiple camera use, but is not Arca compatible. The Befree's yoke has a 3/8"-16 mounting screw, so while the head is replaceable with a beefier model, bear in mind that the legs will not fold as flat as they do with the standard head, nor will they fit in the case. The tripod yoke features a triskelion design, allowing the four-section legs to be to be supported and pivot from one side instead of two, thus reducing the yoke’s size and weight. The legs feature independent spreading with standard 51-degree or wide 25-degree selectable angles that allow you to get close to the ground for low-angle or macro shooting. Instead of tab-type angle selectors, Manfrotto has employed spring-loaded thumb toggles that snap into place. The legs have a "D" shape with one flat side, and the 9.24” rapid, friction-post center column is three-sided to resist torsion. The leg's permanent rubber feet protect floors and other easily scratched surfaces. The head and interior of the angle selectors have tasteful red accents that echo the carry case’s stripe, establishing a stylistic theme. Regarding the removable center column, it's clear that hikers and naturalists will find it handy to shoot ground-hugging subjects like mushrooms, wildflowers, and insects. And here's where the reversible center column comes in handy. With the column reversed, in either the 55- or 21-degree and no-leg-section extension, you can go as low as about 5.0 " with a DSLR. It's a bit tight, but possible. With an advanced point-and-shoot like Canon's G15 that focuses down to 0.4" (1.0 cm), you can lower the column in either leg-angle position to about 2.5" from the ground, taking care not to inadvertently bury your camera in your subject. 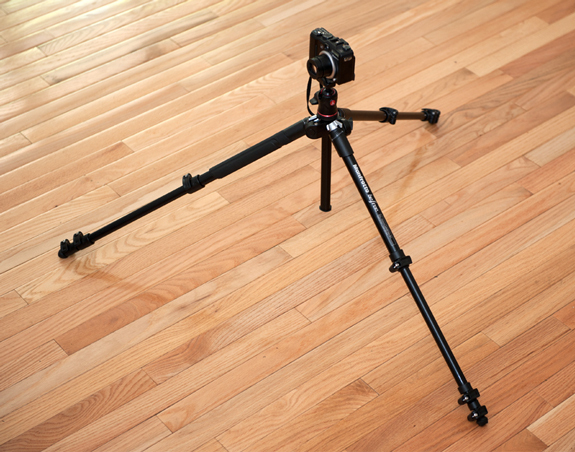 The most punishing test of stability on any tripod is done with its legs and center column fully extended. For lack of a better term, "vibration resonance" defines the slight tremor of a tripod along its length. Obviously, the shorter the vibration time the better, both in terms of how fast you can shoot and how sharp your photos will be. Determining factors are the length of extension, diameter of the legs and center column and as we’ll see later, the footprint-to-extension ratio. I began with my Nikon D700 and 24-70 f/2.8 zoom—a 4.2-lb combination. At maximum extension of the legs and column, a slight tap to the camera caused a vibration that took about 4.0 seconds to subside. Although the column has no counterweight hook, attaching a 5.0-lb shot bag reduced the time to about 3.0 seconds. Retracting the center column yielded a time of approximately 3.0 seconds. The counterweight got it down to 2.0 seconds. I tried the same test with the D700 and an 80-200mm ED f/2.8—an approximately 5.0-lb load. It was no surprise that the vibration resonance lasted almost 5.0 seconds. Adding a counterweight made almost no difference, since the Achilles heel of this setup is the center column. When the center column was retracted the time almost matched that of the 24-70mm f/2.8, both with and without the counterweight. I attributed this to the superior balance achieved by using the lens’s tripod collar instead of the camera connector, which would have made this longer lens quiver like a diving board. Then I used the same test on a lightweight camera—the Canon G7—a little heavier than 11 oz. Surprisingly, at full extension the time was the same as it was with the 80-200mm f/2.8—5.0 seconds. Attaching the 5.0-lb counterweight to the tripod shortened that time to 3.0 seconds. Retracting the center column reduced the vibration resonance to almost nothing without a counterweight. It seems that while the heavier rigs performed better than expected, a camera in the 1- to 2-lb range would perform optimally. The steadiest position all around appeared to be with legs splayed at 25 degrees, one leg extension and no center-column extension. This setup resulted in a footprint of about 33.0” and a height of 18.0”, a ratio of about 2:1, as opposed to a footprint of 47.5” at full extension for a ratio of approximately 1:1. The D700 with the 28-70mm f/2.8 vibrated for 1.0 second while the same camera with the 80-200mm f/2.8 registered 1.5 seconds. Needless to say, the G7 hardly budged. Buying any tripod is a compromise between size, weight, structural integrity and cost, so there is no such thing as perfectly motionless unless you mount a 20.0-lb tripod head on a tower of cinder blocks. When buying a lightweight tripod, you must, excuse the pun, go into it with your eyes open regarding its limitations and how you can, if you're a little bit inventive, circumvent them. I have to admit that I was surprised that with a little care, this tripod could perform well with a 5.0-lb camera/lens combo and, of course, splendidly with a lightweight camera. I did have a mild reservation regarding the quick release. Call me insecure, but I spent a little more time jiggling my $4,000 camera/lens combination into the quick release to feel at ease—but any camera that you can palm while mounting it is a breeze. Given the size/weight/price point, I can comfortably say that the Befree is hard to beat. Update: Along with black, the BeFree aluminum tripod is also available in red, blue, green, and gray. To learn more about this tripod, stop by the B&H SuperStore in New York, speak with a sales professional on the telephone at 1-800-606-6969 or contact us online via Live Chat.